In February of 2014 a volunteer in Stephenson County IL tracked me down, seeking information about a mare I used to own. The mare, who I called Maddie, had been rescued from a neglect situation and is currently (Feb 2014) available from Stephenson County IL Animal Control. The primary contact there is Kristen and her number is 815-266-1574. Maddie is a Thoroughbred, registered with the Jockey Club as “La Cheryl.” She was born in 2000, and stands 16.3 (sticked, not guestimated.) I’m the rider in the picture above, and I’m 5′ 11″ and not a small person. She ran 10 times, won twice (at a mile) and was in the money several times, running in MSW, allowance and claiming company if I recall correctly. She did not earn any black type. My trainer’s friend C acquired Maddie shortly after she was retired from racing. She retrained the mare and did quite a bit with her, taking her to schooling shows. She and another friend, J also taught Maddie to jump. After several years, C got a divorce and had to sell her horses. My friend K, who also rides with my trainer, purchased Maddie. Unfortunately, K then went through her own divorce, and like C, had to sell her horses. 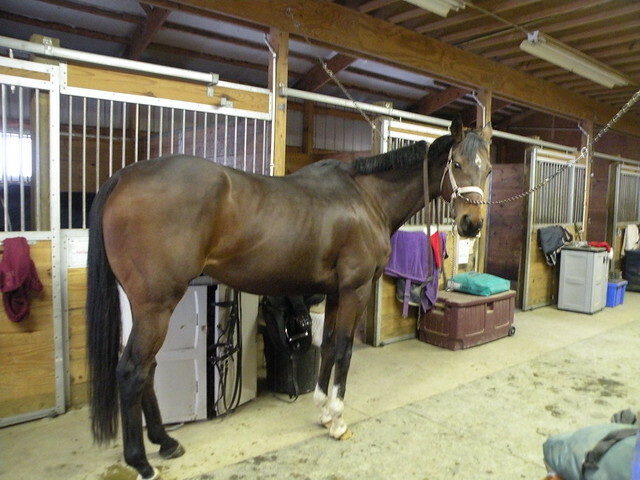 My trainer took Maddie, and put considerable dressage training into her. By the time I started riding her in 2009, Maddie was solid at first level and was schooling second. Maddie is a beautiful and talented horse who proved too much for me (a relatively inexperienced ammie) to handle. She is a pleasure to ride – sensitive and with fantastic gaits, but she tests her rider continually. For example, instead of moving freely forward, she might balk. The rider has a decision to make – insist on forward, or let the mare get away with it. If you let the horse do the latter, you end up with resistant behaviors that escalate. My trainer coached me through the “insist on forward”with a firm correction – when I felt Maddie start to balk, I had to give her a good crack with the dressage whip. That ended the discussion – the mare went nicely forward uncomplainingly. However, it’s easier to say this than to do it – issuing a stern correction at the right time is hard to get right, and requires some bravery. I’m not a confident rider, and this was hard (and unpleasant) for me. This was one of the reasons why I decided that Maddie was not a good fit for me. I sold her to an eventer who I’ll call H in 2011, and that partnership seemed promising. Within a few months, H took Maddie out at a rated show at Silverwood, starting at Beginner Novice, and they won. However, H was campaigning two other horses, and simply couldn’t swing showing a third horse at the time for financial reasons. She is good friends with J (the same J who knew Maddie when she was with C, and taught her to jump,) and J had just retired her riding horse. J took Maddie. At this point I am piecing the story together as best I can, based on messages from H and J and what I know about the horse’s current situation. J had some of the same issues I did – she was in grad school and wasn’t riding consistently. Additionally, I know that J had some issues with saddle fit (more on that below) and I do know that Maddie is pretty sensitive – if she doesn’t like something, she will tell you loud and clear. This is not a beginner horse. To be ridden safely she requires a confident and assertive rider who knows when to issue corrections and can identify when Maddie is testing their authority. While a good trainer could get her going well again, I believe it would be irresponsible to sell her to an inexperienced person. A home with a confident rider or as a racing broodmare would be the best fit. 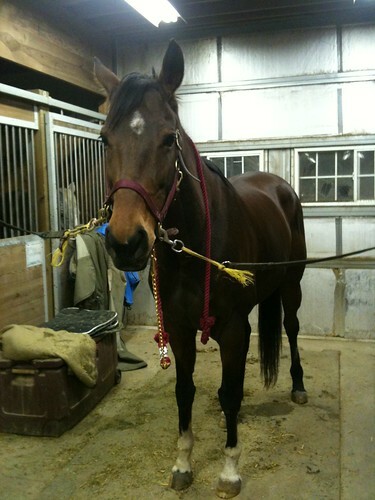 Maddie is an alpha type personality mare and her owner needs to continually reinforce their leadership. She is a very fast learner – there’s no need to be physically tough with her. But one does need to be continually aware that the mare is trying to get you to give an inch so she can take a mile. She has some issues with cross ties. I schooled her through some of them but she always knew she could break them and she did a few times. From what I gathered in message with J, this behavior has continued. Saddle fit is important with all horses, but with a horse that is sensitive and reactive like Maddie, it is crucial. I rode her exclusively in a Wintec Isabell with a medium-narrow gullet, and a fleece pad underneath. I was careless about gullet width one time, and rode her for a couple days in a saddle that had a medium gullet (it looked fine) and was rewarded with a very sore and grouchy mare. Pay attention to her back. When she’s sore, she is likely to act out, becoming more resistant. In fact, if she is being uncharacteristically resistant, the first thing I’d look at is her saddle fit, and check whether or not her back is tender. Mads went very well for me in a simple Myler french link snaffle.